Some people with mortgages these days find themselves a victim of the current economy and unable to pay their loans. Sometimes, they can even be underwater on their loans to the point where a refinance doesn’t help. As of April 3rd of 2015, the U.S. Bureau of Labor Statistics said that the unemployment rate was at 5.5 percent, which sounds low, but accounts for 8.6 million jobless people in our country. First of all, you are not a failure. Assuming you are a financially responsible person and are just affected by the economic stresses of our time, you were just placed in a bad situation. Maybe you thought your job was secure, or your health was fine, and everything was comfortable when you first obtained the loan. Losing your job or incurring medical bills isn’t a primary thought on people’s minds. To use a football analogy here – your Hail Mary pass is going to be the short sale. What exactly is it and how will it help you? Let’s begin by comparing foreclosures and short sales. Foreclosure is when the lender now owns your home when you default on payments and the record of this foreclosure remains on your credit report for years. In a Short Sale, the lender and the borrower reach a compromise. The property sells for less than it is worth and the lender takes a small financial hit so the borrower doesn’t have to default on the loan. This is not to be confused with a Deed in Lieu, in which a short sale is pursued, but does not happen. This is when the borrower waves the white flag and voluntarily gives the lender the title in exchange for being freed from the loan. This option also benefits the borrower, but is used as a last ditch effort if a short sale does not happen. However, a foreclosure and a deed in lieu will damage the credit much more than a short sale. Read further for more info on the short sale option. If you want to contact us, use our chat feature on this page to ask us questions, or call 1-877-432-LOAN. 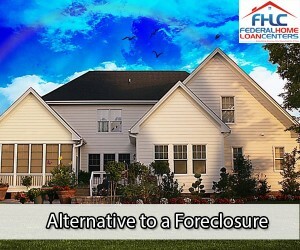 Usually, the lender will want to take place in a short sale rather than letting the home go to a foreclosure status. This way, there is an actual amount of money obtained on the property instead of hoping the foreclosed home will attract a new buyer, while sitting there unpaid for. There is a bit of a stigma against foreclosed houses where many buyers assume that the person knew they couldn’t keep up with the loan, so they let their home turn into a dump before they were kicked out. While this is not always true, the fact that the new home owner coming into the foreclosed property has to sign off on a lot of legal documents waiving any liability of the lender leaves some feeling sketchy. We heard about the possible scenario why the lender would want a short sale. Now we come to why it will benefit you, the borrower. Your credit history will hold the short sale report on your record, just like the foreclosure, but you will be eligible for a future home loan a lot sooner than a foreclosure. In many cases, this is because the short sale showed that the borrower had the initiative to intervene before they defaulted on a loan. This is the same case for the deed in lieu. Making some sort of effort to make sure the lender does not take a total loss on the property looks better than going to a foreclosure status. Ready to pursue a short sale, or have any other home loan questions? Use our chat feature at on this page to ask us questions, or call 1-877-432-LOAN. You may think conventional home loans are the only kind that can have a short sale, but government loans are eligible, too! There are exceptions, when it comes to short sales. According to conventional loan stipulations from The Federal National Mortgage Association and The Federal Home Loan Mortgage Corporation, two years is the typical waiting time after a short sale. The only time it is a longer wait is if your short sale was due to financial irresponsibility and not a lost job, medical issues, or some sort of other life event beyond your control that keeps you from paying the loan. For the VA Home Loan, a short sale is called a “compromise sale”. The VA actually has a department dedicated to assisting veterans when they are close to defaulting on their loan. As long as you never have a foreclosure or default on a home loan in any way, you will always be eligible to apply for a new VA Home Loan in the future, when you can afford to try again at home ownership. The lender will then decide if the risk of letting you borrow is worth it to them. When applying for an FHA Home Loan, because of the FHA “Back to Work” pilot program, flexible lenders will usually only require you to wait a year after a short sale. You can apply for this loan a year after a foreclosure, but if you also have declared bankruptcy within two years of the short sale, you will have to wait two years. After 2016, these rules may change . With the USDA Home Loan, the typical waiting period after a short sale, foreclosure or bankruptcy is 36 months (three years). Since the USDA will only deem certain properties and areas as “rural” for their loans, you may be well to check on your FHA loan eligibility if you have had a short sale within the past three years or less. We hope now that you see the benefits of using a short sale, or deed in lieu, as an alternative to a foreclosure. While it is going to be a red flag on your credit score all the same, the circumstances behind pursuing a short sale or deed in lieu will show a new lender that you truly tried to prevent the previous lender from taking a financial beating.